People talk about kids leaving the nest all the time, but what they don’t always mention is how the momma bird occasionally has to leave the nest too. 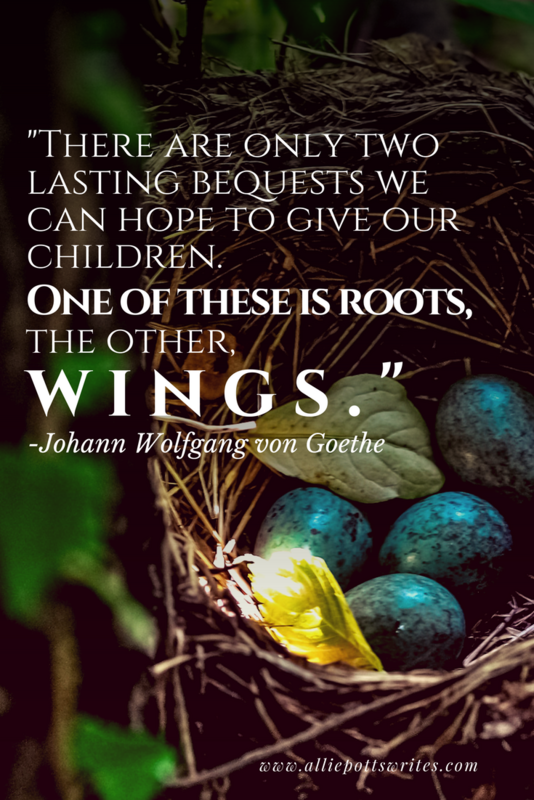 Her babies are hatched, though because they not self-sufficient, it is critical that she spread her wings and brave the unknown in order to ensure everyone, herself included, reach their full potential. Baby birds have to eat, but also they need to be shown how to be the best sort of birds, which means, eventually, Momma bird has to get over her fears, remember how to fly, and lead by example. People aren’t all that different. More specifically, I’m not that different. My nest, however, isn’t made of sticks or straw. My nest is a series of jobs I managed to pick up over the years and a career I built up along the way. And I’m not complaining about my nest. The people I’ve met along the way have been great. I’ve traveled the world and got to see first hand how things were made. It gave me opportunities I might never have imagined for myself. I am as proud of what I built as I am of my other accomplishments. However, my nest no longer fit like it once did. While it still kept the cold out, the straw I’d grown so comfortable in over the years no longer provided the same amount of cushioning. The sticks I’d woven together itched my feathers in ways I couldn’t fully explain and the gaps in my nest’s construction were no longer something I could ignore. Just another normal day at the office. I was left with two options: rebuild it by re-weaving together bits and pieces of my existing nest, hopeful that the results would prove adequate for my needs, or I could take a chance, stretch my wings, and try something new. An opportunity appeared and I took it. This month, I am starting a new job with a company I’ve never worked with before. It is the first time I’ve been able to say that in more than fifteen years. I am frankly terrified. What if I am making a mistake? What if it doesn’t work out? What if I fall? I don’t know how these new sticks will fit together or how well they’ll prove to keep out the rain, but I’m excited to say that I’ve tried. When people ask me what I do, I will be able to say I’m a full-time writer (though I’ll always be an author, engineer, project manager, designer and a self-professed geek too – once you have the knack, it never leaves you). What will this mean for my blog? Hopefully nothing other than my blog becoming an on-going example of someone who chose to take a chance on themselves, which in a way was the point of me starting in the first place and why I’ve always been drawn to topics about goals, and risk, and determination. I will be taking next week off to give myself time to say my goodbyes in and around the office while preparing for my next step forward, but I hope to report back from the other side very soon. Best of luck to you! I hope you love the new job and that the goodbyes aren’t too difficult. 🙂 Thanks! There have been a few bittersweet moments. It is definitely weird packing away what has essentially been my home away from home for the last several years or noting that my daily commute won’t be the same, but overall I am really looking forward it. And glad you liked the video! The song has been stuck in my head for days. I love that the lyrics are simple because they didn’t speak English, but sang it anyway. They didn’t speak English? I missed that tidbit. Neat! That’s what I read. It was one of those things I learned when I was trying to verify that there really weren’t any other lyrics. Congrats on the new job Allie! I look forward to hearing more and seeing where this takes you. 🙂 And I look forward to telling you all about it. Windows open for new experiences. Good for you! Cautionary tale, birds coming through windows are not a good thing but think of the writing topic possibilities! See – this is why I procrastinate cleaning my windows – so the birds don’t think they can fly through them. I am such the animal lover. Thank you! It’s going to be an adjustment for everyone but we are all excited. Congratulations on your new job. I hope it’s everything that you hope it’ll be– and none of the lousy things that you fear it might be. And as for your blog, I look forward to reading about whatever you write about. Congrats on your new job! So excited to hear where your new adventure takes you! Thank you! My passport might not be filled quite so quickly anymore, but I agree it is going to be an adventure all the same. Sounds like exciting times, Allie. All the very best in your new job. Thank you! I’m really looking forward to it, though not being the expert in the room may take some getting used to. Everything you’ve written here about taking a chance on a new job applies perfectly to the chance I am taking moving halfway across the country. Am I scared sometimes? You’d better believe it. There are no guarantees this will work out. But life’s a risk anyway, right? So I’m sure going to try my best to make sure this ends up being a great move, figuratively and literally. Best of luck to you in your new job, mama bird! I absolutely agree. I would much rather say I wish I hadn’t done that rather than I wish I had. Congratulations on this next step! I know you will meet this new challenge with confidence. Shaking it up can be hard but rewarding. Best of luck in these exciting times! Fly, Robin, fly! Also love the hawk photo! 🙂 There is a family of those hawks that live in the trees around my soon to be former office, but I did not expect one to be hanging out in the parking lot. Ooh congratulations! Can’t wait to hear about the new gig! Congratulations, Allie. And, seriously, go you. I mean, it’s tough to make a change like this. I have all the faith in you but I imagine it’s a bit scary. I’m so happy for you. 🙂 Best of everything, my friend. And a Happy (belated) Mother’s Day! Thank you! There were a few moments, as I was typing up my notice, I thought I might throw up, but I somehow managed to turn it in any way. May I still learn to rue the day? Maybe, but at least I’ll know I tried. Happy belated Mother’s Day to you too! Cheers to taking chances and to new adventures!